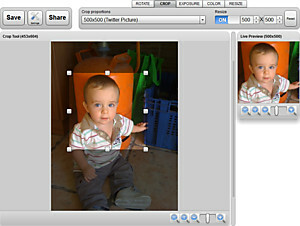 goDromo Photo Cropper allows you to cut or crop your photos, selecting only the portions of your photo that you are interested in keeping. Being part of goDromo Photo Editor, using it is fun, quick and easy. The Crop Tool, the tool you use to select the region of interest. The Crop Proportions Bar, a selection of presets to quickly select the dimensions of the crop. The Resizer, to resize the resulting final photo to any dimension required.